Cynthia Ho (top right) leads the charge to clean and sort debris at Puako Boat Ramp to prevent coral reef pollution and wildfires. What starts mauka, must come makai. Wildfires not only impact native forests, they also have severe impacts on our coastal resources. 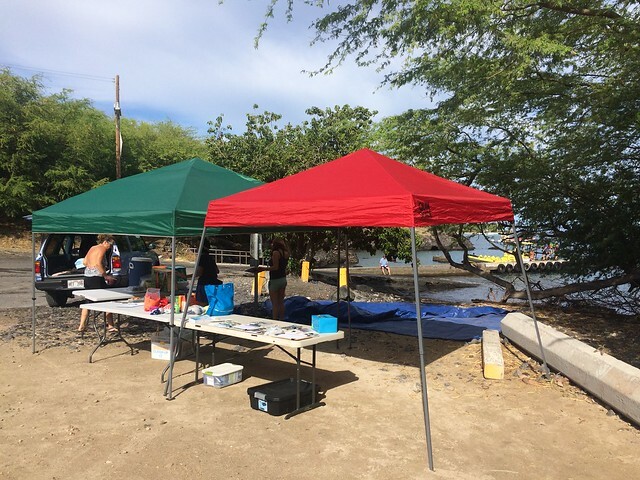 Keep Puako Beautiful and Coral Reef Alliance’s Cythia Ho rallied several organizations including HWMO and community volunteers to join in a morning trash clean-up of Puako Boat Ramp. A popular boat launch and diving area, Puako Boat Ramp plays host to a variety of different users and is known to be a point source for pollution, runoff, and the occasional wildfire. During the cleanup, volunteers picked-up close to 1,000 cigarette butts along with other waste items including fishing line and styrofoam which are harmful to sea life. We strongly urge all of our island ‘ohana to dispose trash properly and responsibly to keep our coastlines beautiful and fire-free. HWMO also made a connection with Hawaii State Parks representative, Dena Sedar, who plans to share Kaleo the Pueo coloring sheets with keiki visitors to Lapakahi State Park.